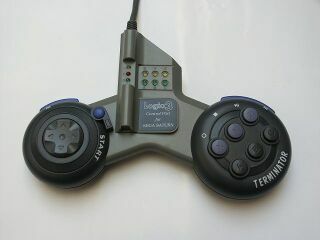 The Terminator is a third-party controller for the Sega Saturn created by Logic 3. Despite its odd shape, it is no different than a standard Saturn control pad, though does come equipped with extra LEDs. A turbo version was released as the Voyager. Main article: Terminator (accessory)/Magazine articles.